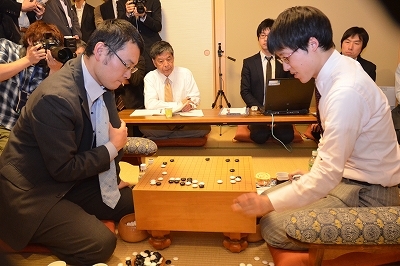 Cho U keeps sole lead in the Meijin League: Two important games in the 38th Meijin League were played on May 2. 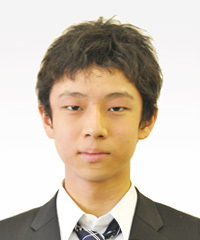 In one, Cho U 9P (W) beat Mizokami Tomochika 8P by resignation; in the other, Iyama Yuta Kisei (B) beat Sakai Hideyuki 8-dan, also by resignation. As a result, Cho improved his score to 5-0 and kept the sole lead. Iyama is in second place, on 5-1. The two are scheduled to play each other in June. The only other player with one loss is Hane Naoki, who is on 4-1. However, he has a bye in May. Two more games were played on May 9. 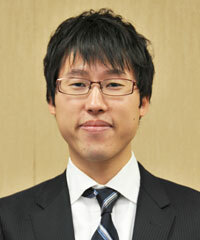 Takao Shinji 9P (W) beat Murakawa Daisuke 7P by resignation and Kono Rin 9P beat Yuki Satoshi Judan, also by resignation. These results meant that Takao and Kono both kept their hopes of winning the league alive, as each has only two losses (Takao is 4-2 and Kono is 3-2). Neither has played Cho yet, so they need to “cooperate” to drag him down. Of course, they need Iyama to stumble as well. Incidentally, Yuki’s jinx continues: he has now lost 15 games in a row over three Meijin legues. Photo: Cho U, Official Nihon Ki-in photo. Kisei Leagues starts: The 38th Kisei Leagues got off to a start with a game in the A League. 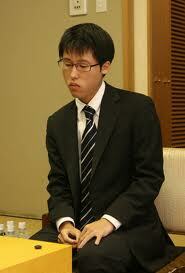 Taking black, Yamashita Keigo Meijin beat Yoda Norimoto 9P by 5.5 points. Honinbo title match starts on 16th: The big game later this week will be the first game of the 68th Honinbo title match, in which Takao Shinji 9P is challenging Iyama Yuta Honinbo. The game will be played on May 16 & 17. Takao has a dismal record against Iyama of 5 wins to 17 losses, but he was in superb form in the Honinbo League, which he won 7-0, so the title match is unlikely to be one-sided. 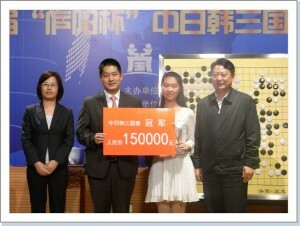 Professional Pair Go championship: The E-Journal reported on this tournament on May 6th. The Japanese Pair Go Association would like to add some details about the event. The official name of the tournament is the 1st China-Japan-Korea Professional Pair Go Championship. 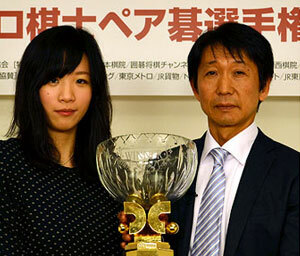 It is notable as the first purely professional international Pair Go tournament. The first tournament in which professionals took part was the Pair Go World Cup 2010, which was held in Hangzhou, China. It was organized by the World Pair Go Association, and a total of 16 professional and amateur players took part. This tournament was popular with spectators and go fans. 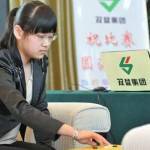 This year’s event was organized by the WPGA with the cooperation of the Chinese Weiqi Association, Anhui Province and Hefei City. Matsuura Koichiro, President of the WPGA and former Director-General of Unesco, attended the tournament to give out prizes. A large number of photos and the game records can be found at the home pages of the Japan Pair Go Association and on the Pandanet page for the tournament. Photo: Pair Go Winners, representing China, Wang Chenxing 5-dan & Chang Hao 9-dan. From Pandanet. Yuki takes Judan Title, Reducing Iyama to Quintuple Crown: Challenger Yuki Satoshi 9P put an end to Iyama Yuta’s reign as a sextuple titleholder on April 26 when he won the final game of the 51st Judan title match, which was played at the headquarters of the Kansai Ki-in. Taking white, Yuki won by 1.5 points after 261 moves to win his second top-seven title. Yuki took the lead in the middle game and thereafter, thanks to accurate play, managed to fend off Iyama’s attempts to catch up. 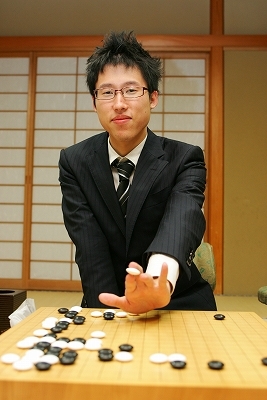 Yuki is the fourth Kansai Ki-in player to win the Judan title. 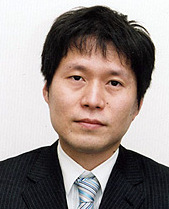 He has now won 11 titles, but nine of these are fast-go titles; his only previous top-seven title was the 36th Tengen title, which he won in 2010. 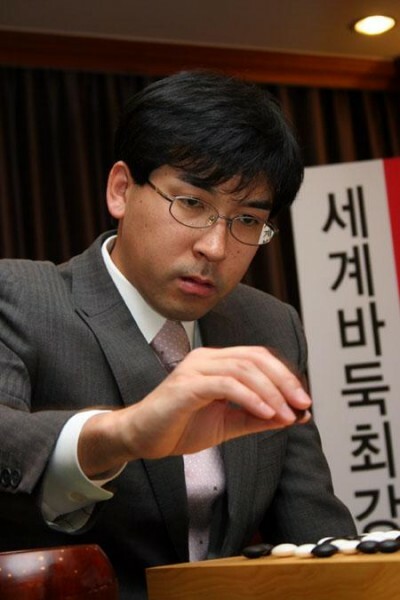 In March, Iyama became the first player ever to hold six of the top-seven titles simultaneously, and there was a lot of speculation about his chances of monopolizing all seven by winning the Meijin title later this year. That prospect has now been ruled out after his reign as a sextuple titleholder ended after just 43 days. To have a second crack at this goal, Iyama will have to hang on to his other titles, then regain the Judan title next year, while also picking up the Meijin title this year or next year. As with the fourth game, all the interest of the press focused on Iyama at the end of the game, with photographers snapping him, not the winner. The report the next day in the Yomiuri newspaper, for example, featured a photo of Iyama with the headline ‘Iyama reduced to five crowns.’ Yuki probably was philosophical about this; after all, he had the title, and his career had reached a new peak at the ‘advanced’ age, for tournament go, of 41. Round 1 (April 26): Japan 2, Taiwan 1: Xie Yimin (Hsieh I-min) 6P (B) defeated Hei Jiajia (Joanne Missingham) 6P by half a point; Okuda Aya 3P (W) lost to Su Shengfang 2P by resignation; Mukai Chiaki 5P (B) d. Zhang Zhengping 3P by resig. 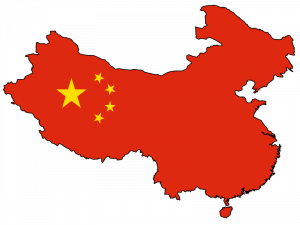 ; China 2, Korea 1: Li He 5P (W) d. Pak Chi-eun 9P by 3.5 points; Tang Yi 2P (B) lost to Kim Mi-li 2P by resig; Wang Chenxing 5P (W) d. Kim Ch’ae-yeong 1P by resig. Round 2 (April 27): Korea 2, Japan 1: Pak (B) d. Xie by resig. ; Kim Mi-li (W) d. Okuda by resig. ; Kim (B) lost to Mukai by resig. ; China 3, Chinese Taipei 0: Li (B) d. Hei by resig. ; Tang (W) d. Su by resig. ; Wang (B) d. Zhang by resig. 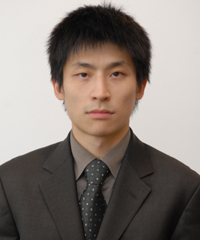 Round 3 (April 28): Japan 2, China 1: Xie (B) d. Li by resig. ; Okuda (W) lost to Tang by resig. 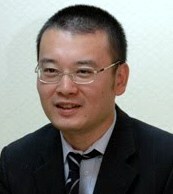 ; Mukai (B) d. Wang by half a point. ; Korea 3, Chinese Taipei 0: Pak (W) d. Hei by resig. ; Kim Mi-li (B) d. Su by resig. ; Kim (W) d. Zhang by resig. After losing two games in a row in the 51st Judan title match, Iyama Yuta 9P has stopped the rot and evened the series against Yuki Satoshi 9P. The fourth game was played on Iyama’s home ground of the Kansai headquarters of the Nihon Ki-in in Kita Ward, Osaka, on April 18. This was the day that Iyama could lose his sextuple crown, so there was an unusually large press contingent in attendance, just in case. stones and put the game out of Yuki’s reach. 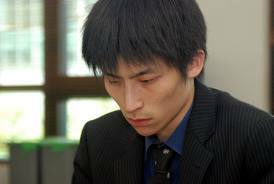 Yuki resigned after move 179.
an interview, Iyama expressed his relief at getting a win after two games in which ‘my play was hopeless’. Yuki has another chance to take his second top-seven title, but psychologically this convincing win may have tilted the balance in Iyama’s favour. The final game will be played at the Kansai Ki-in, Yuki’s home ground, on Friday, April 26.